Business people often discuss the way their case management application should function by describing the stages that a case goes through as it is worked to completion. With the Pega 7 Case Designer, business executives use the power of case lifecycle design and management to capture their vision exactly how they describe and think about it. With the Pega 7 Case Designer, you design your application by describing the stages within a case type, then define the steps or processes that happen in each stage. Business people have an easy way to capture objectives in a single view that all parties from application designers to executives to end users can examine to understand how a particular case type works and progresses. A company provides an accounting application that its personnel use to request and approve purchases. If asked to describe this purchase request procedure, a business person is likely to describe the process in terms of stages, beginning with creation of a purchase request and ending with the delivery of any items ordered. Each of these stages has specific steps that may or may not be required before the purchase request (or case) can advance to the next stage. A requestor creates a purchase request to obtain software. A vendor is selected for the request. The vendor provides a quote for the requested software. The purchase request is approved according to company procedures. 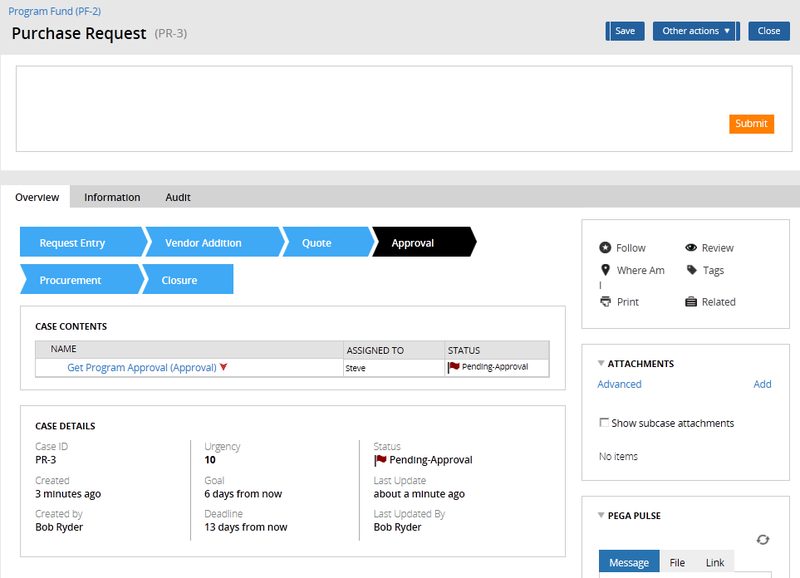 The software is ordered, delivered, and provided to the requestor. The application closes the request. Within each stage, the case progresses through some required processes, and can progress through some optional processes, in allowed conditions. For instance, during the Procurement stage, steps include notifying the requestor, creating the necessary purchase orders to pay for the items requested, and awaiting delivery of the items ordered. The Pega 7 Case Designer helps business leaders capture objectives and transform that vision into a case lifecycle application. In the example above, accounting professionals describe the stages and steps that are required to file and fulfill purchase requests. A business leader or application designer uses that information to define the individual stages that contain specific processes. The example below depicts how the purchasing application appears as stages within the new Case Designer. A stage is a first level of organizing all the different tasks required to complete work associated with a case. For example, you might use a checklist to capture the large, and then small, tasks we need to complete for a given job or project. That checklist is similar to a stage. You identify the high-level groupings, then organize the required and optional tasks you have to perform within each grouping, to get a sense of what you have to do first, what must happen in sequence, and what can happen in parallel. You essentially compartmentalize the tasks to be performed and decisions to be made as you manage the lifecycle of a case. Configurable attributes define how cases progress in, through, and out of the stages of a case type. 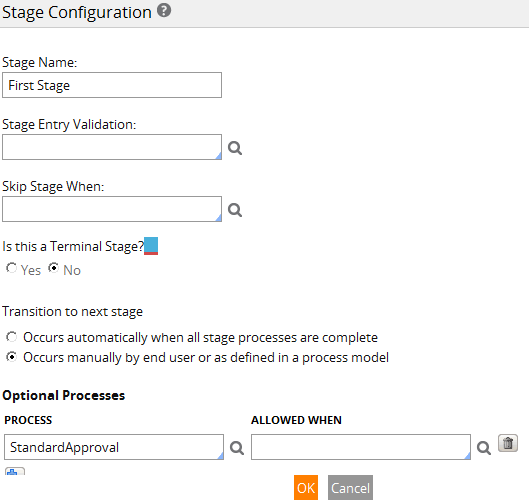 The Stage Configuration dialog allows you to identify criteria that a case must meet in order to enter the stage, provide a condition for when the stage should be skipped completely, define whether the stage is the last in the process, indicate whether a case transitions to another stage manually or automatically, and list optional processes and actions that may be run in that stage, along with the conditions that define when they are allowed to run. For more information, see Configure stages for your application. Your case type has primary stages that cases progress through as work is completed. You may also have alternate stages that are not part of 'normal' processing, but must be available under certain circumstances. These alternate stages can only be accessed manually, and therefore have no sense of sequence relative to the other stages – no sense of being 'next'. For example, while building an insurance application, the designer considers that some claims are fulfilled and some claims are denied as part of normal disposition. Occasionally, when a request is denied, the requestor is notified by email. This scenario is not part of normal processing, and does not need to be a primary stage of the case type. However, the end user needs to be able to manually transition the case to an alternate stage, such as Rejection, as needed. The table below describes the methods you can use to transition cases among stages. At design time, by default, any configured alternate stages appear. You can click the Hide Alternate Stages button to remove them from the display. This action only serves to hide the stages. To make the alternate stages re-appear, click the Configure Alternate Stages button. A stage legend is available from the Case Designer. This legend helps the application designer understand the meaning of shapes and icons used in the stage view. Any process in a stage that does not have the arrow launches at once. Resolution stages are planning devices only, with no functional behavior, no ability to resolve or close a case. When you configure a resolution stage, you do not specify how you want to transition. As an end user processes work in a case lifecycle application, the representative chevrons for the stages appear on their user interface. This feature helps the user to quickly determine where this case is in the workflow for this case type. The Process Outline offers a familiar, instinctive, and intuitive view of your stage. 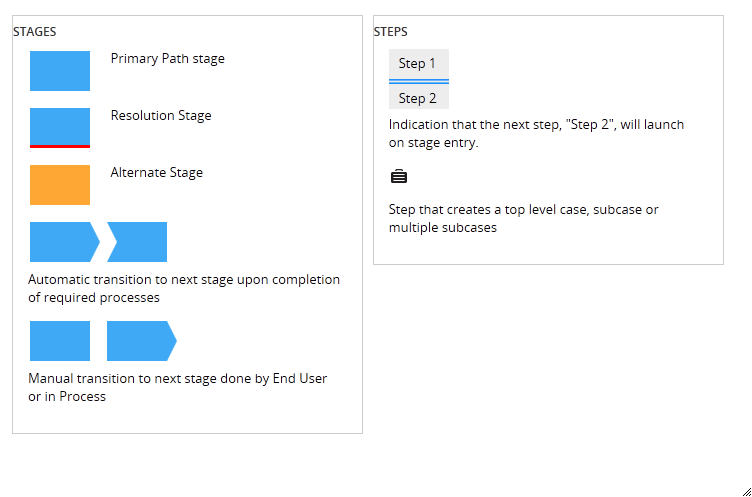 When you click Configure Process Detail for a given stage, all the stages and steps are collected into a single view. The stage's assignments, processes, and cases appear on the left panel, with process contents appearing as indented items. A step in a stage can represent a single assignment, a multi-step process, or another case, as in the example above. Generate Purchase Orders is an assignment, while Wait for Fulfillment is a process. The Process Outline provides all of the functionality available to you from the Diagram tab of the Process Modeler, if you have appropriate permissions. You can configure assignment and case properties, and add, remove, and rename shapes in flows. Remember to save any changes you make in the outline view. If you did not make any changes, you can click the Back to stages button.